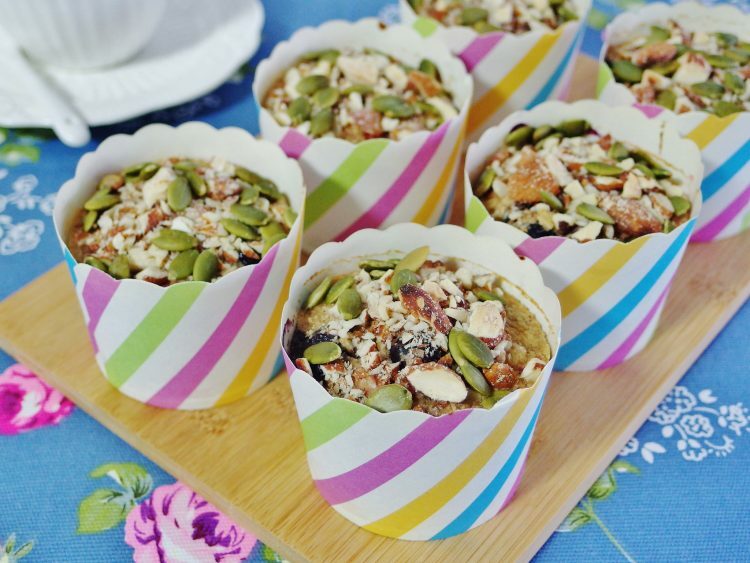 Sharing a Healthy Summer Berry Muffins Recipe today that’s packed full of fibre and antioxidants and yet have a lower GI (and sugar content too) than other regular muffins. What makes this recipe special is that these muffins contained no regular flour (all-purpose/plain). 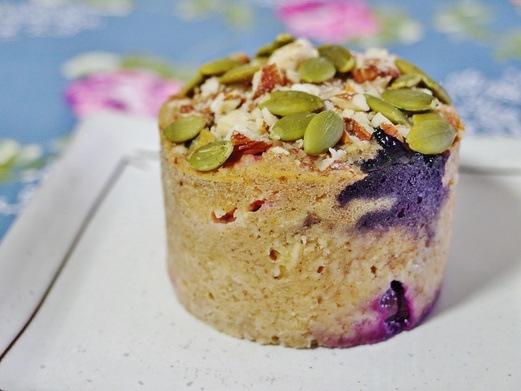 They were made with pulverised rolled oats which was like homemade oat ‘flour’. It was my first-time experimenting with just rolled oats and the muffins turned out pretty well. The muffins came off the paper cups beautifully and looked amazingly soft and moist. Even when I kept the balance in the fridge till next day, they were still moist and delicious. 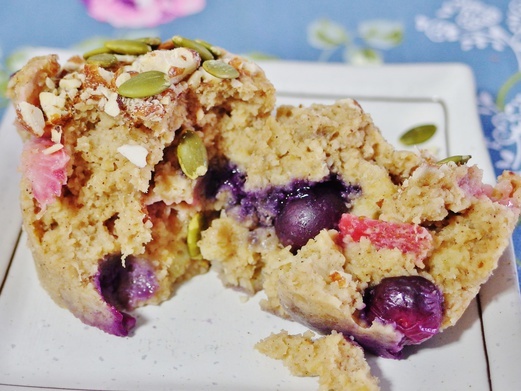 Healthy and nutritious sweet treat – there’s no reason not to try. Preheat oven to 180 deg C. Line a 12-hole muffin tray with paper cups. Combine rolled oats (both pulverised & unpulverised), salt, baking powder and cinnamon in a bowl. Stir to mix. In a large mixing bowl, add the sugar, oil, mashed bananas, eggs and soy milk. Whisk till well combined. Add the berries and stir until just combined. Pour the batter into the muffin cups and sprinkle the almonds and pumpkin seeds on top. Bake for 25 minutes. Cool the muffins on a wire rack for at least 1 hour before storing. I’ve not been able to keep up with blogging for quite some time now since my health started going downhill. Two years have barely passed since the removal of my left thyroid and it seems like the nodules on my remaining right thyroid are starting to grow in size which means I may need surgery again in the time to come. And that thyroid isn’t functioning well at the moment too. My blood tests have shown a pattern of increasing TSH and decreasing thyroxine which means I have hypothyroidism and it’s the main culprit that’s giving me all these symptoms that are affecting my daily routine. I just feel extremely sad and discouraged that despite all that I’ve done and tried to do to improve my overall health and mental state, I’m back to square one again. It is so easy to give up at this point in time even though I can also choose to pull myself together and persevere. But it’s so easier said than done. Can one ever feel worse than being depressed? The rate of seeing family members around me losing the battle to cancer had been very alarming. Just last week, one more succumbed to lung cancer. I just got reminded again about this whole episode when I was doing a survey on cancer some days back and then I realised the number of losses that had occurred over the last couple of years had been unbelievably high. When J’s CEA cancer marker test came out abnormal, it just hit me again that the line between life and death is very thin. He is scheduled for gastroscopy and colonoscopy to rule out the possibilities of stomach or colon cancer, followed by a CT scan to check on the pancreas, spleen, liver and kidneys. Yes, so I really have to pull myself together just so I can recover fast to be able to look after him should anything happens. Life is too short. We just have to do our best.